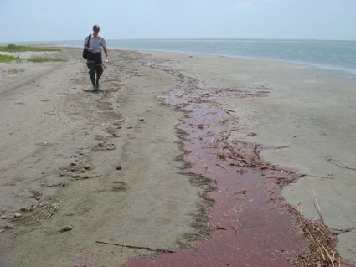 When we talk about oil spills, how much oil are we talking about? The United States uses more than 800 million gallons of oil every day. The world uses more than 3.5 billion gallons each day. Until the 2010 Deepwater Horizon oil spill in the Gulf of Mexico, the largest spill in the United States was the Exxon Valdez spill into Prince William Sound, Alaska, in March 1989. An oil tanker ran aground to cause this spill of almost 11 million gallons of crude oil. While this was a big spill, it was actually only a small fraction—less than 2 percent—of what the United States uses in one day! These big numbers are hard to relate to everyday life, so let's make some comparisons. To better understand how much 11 million gallons of oil is, check the table below. It shows how many familiar rooms or buildings would be filled up by the approximate amount of oil spilled from the Exxon Valdez. For example, that oil would have filled up nine school gyms or 430 classrooms. What do we use all this oil for? fuel our cars, trucks, and buses and to heat our houses. lubricate machinery large and small, such as manufacturing equipment or bicycles. make the asphalt we use to pave our roads. make plastics, such as the toys we play with and the packaging on food we eat. make medicines, ink, fertilizers, pesticides, paints, varnishes, and electricity. Next page: Find out how spills happen and how people clean up the oil.